The Birmingham Hippodrome is a theatre situated on Hurst Street in the Chinese Quarter of Birmingham, England. Although best known as the home stage of the Birmingham Royal Ballet, it also hosts a wide variety of other performances including visiting opera and ballet companies, touring West End shows, pantomime and drama. The Hippodrome is the venue for West End touring theatrical shows, such as Wicked, Chitty Chitty Bang Bang, The Lion King, Matilda, Mary Poppins and We Will Rock You. The theatre's Christmas pantomimes are produced by Qdos Entertainment, over recent years attracting stars such as Brian Conley, Don Maclean, Julian Clary, Joe Pasquale, John Barrowman, Joan Collins, Nigel Havers, Keith Harris, Lynda Bellingham, Lesley Joseph, Gary Wilmot, Paul Zerdin, Gok Wan, John Partridge, Jane McDonald, Marti Pellow, Lee Mead, The Krankies, Steve McFadden, Jodie Prenger and Andrew Ryan. Comedian Matt Slack has appeared since 2013, returning due to popular demand. With a regular annual attendance of over 600,000, the Hippodrome is the busiest single theatre in the United Kingdom, and the busiest venue for dance outside London. The first venue built on the Hippodrome site was a building of assembly rooms in 1895. In 1899 the venue was redesigned by local architect F. W. Lloyd, a stage and circus ring was added together with a Moorish tower (removed 1963) and the enterprise named the "Tower of Varieties". After failing, this was soon rebuilt as a normal variety theatre, reopened as the "Tivoli" in 1900, finally becoming "The Hippodrome" under the ownership of impresario Thomas Barrasford in October 1903. The current neo-classical auditorium seats 1,900 and was designed by Burdwood and Mitchell in 1924. Following the construction of the nearby Smallbrook Queensway, the entrance building and tower were demolished in 1963, and a new modern entrance constructed. At the same time, the theatre was renamed 'Birmingham Theatre' for a time. This plain facade was refaced in the 1980s with a mock-Victorian plasterwork, whilst the stagehouse was demolished and rebuilt to accommodate larger shows. The decade also saw the theatre host the Central Television revival of the ITV talent show New Faces, hosted by Marti Caine. The exterior of the theatre was substantially rebuilt by Associated Architects and Law and Dunbar-Nasmith in 2001, with a new glass facade and accommodation for the Birmingham Royal Ballet and additional performance space. In July 2015, comedian and actor Brian Conley was celebrated at the end of a performance of Barnum, having performed at the Hippodrome for 600 performances, appearing in six pantomimes, Jolson, Chitty Chitty Bang Bang, Hairspray, Oliver! and hosting the 1999 Royal Variety Performance at the theatre. ^ "Birmingham Hippodrome". The Dance Consortium. Retrieved 25 September 2012. ; "Birmingham Hippodrome Achieves Business Continuity with SteelEye LifeKeeper". PRWeb. Menlo Park, CA: Vocus PRW Holdings. 2009. Retrieved 25 September 2012. ; "Glenn Howells and Mike Hayes join board of Birmingham Hippodrome". Birmingham Post. Trinity Mirror Midlands. 19 April 2012. Retrieved 25 September 2012. ^ "International Dance Festival Birmingham 2010". Birmingham City Council. 2010. Retrieved 25 September 2012. ^ "Building Stories". birminghamhippodromeheritage.com. Birmingham Hippodrome. ^ Laws, Roz (9 July 2015). "Brian Conley celebrates 600 appearances at Birmingham Hippodrome". birminghammail. Retrieved 20 April 2017. 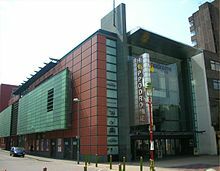 Wikimedia Commons has media related to Birmingham Hippodrome. This page was last edited on 9 January 2019, at 22:53 (UTC).